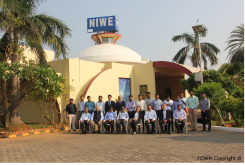 The FOWPI Project Management Team organized a one day workshop on "Foundation Design for Offshore Windfarms in India" at the premises of National Institute of Wind Energy (NIWE), Chennai, Tamil Nadu on 20th March 2018. The key findings and assessments related to the Offshore Wind Foundation Designs for the 200 MW demonstration project were presented through an interactive session. Dr. Katayal has done his Ph.D. in "Wind Variability Analysis and Shape Optimization in Wind Sensitive Structures" and Masters in Stress and Vibration Analysis, Machinery and Structures, from Maulana Azad College of Technology, Bhopal. His core areas of expertise include Design & Analysis of lattice and tubular towers, performance enhancement of wind turbine components and sub-assemblies, hybrid systems for remote rural applications and Testing of Small Wind Turbines. Presently he is looking after the development of offshore activities in India. Gabriel Zeitouni has been assisting the project head of FOWPI and is responsible for monitoring the various work packages within the FOWPI’s scope. Gabriel has a master degree in wind energy from DTU Denmark and has been working for COWI in both project manager and specialist roles. As Technical Director in COWI's Hamburg office, Dr Kelm is COWI's key expert in the design of monopile foundations for offshore wind. Dr Kelm's extensive experience includes multiple offshore wind farms at both mature and new offshore wind markets, including: France, Germany, Netherlands, Belgium, Taiwan and UK. Mr. Sinha is currently working as the Manager-Business Development at GeoSea, DEME Group.